Symbolic violence in the learning process has to be discontinued because it is not in accordance with national education objectives and is also against children’s rights. 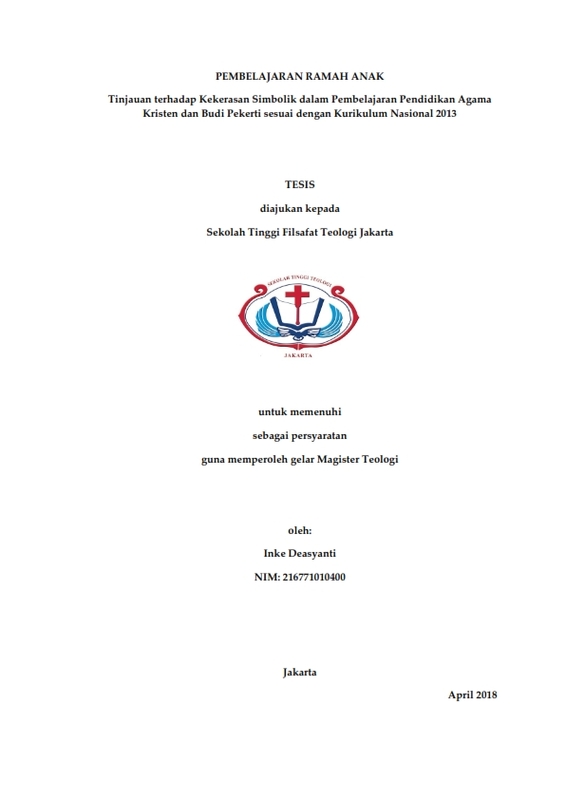 The purpose of this thesis writing is to see the potential of symbolic violence occurrence in the learning process of Pendidikan Agama Kristen and Budi Pekerti based on National Curriculum 2013 in SDK 4 BPK PENABUR Jakarta. The research data will be analyzed from the curriculum observation, syllabi, learning plans (RPP), textbooks as well as class observation. Through her research, the writer finds there are at least seven learning indicators filled with symbolic violence. As one way to avoid learning filled with symbolic violence, the writer then proposes a child-friendly learning. This child-friendly learning has several principles, namely the learning is not dominated by teachers, uses a variety of methods and learning media, corresponds with students’ daily lives, delivers knowledge cognitively, affectively and psychomotorically, and is set in comfortable classrooms. as an evergreen tree of diabolical knowledge.